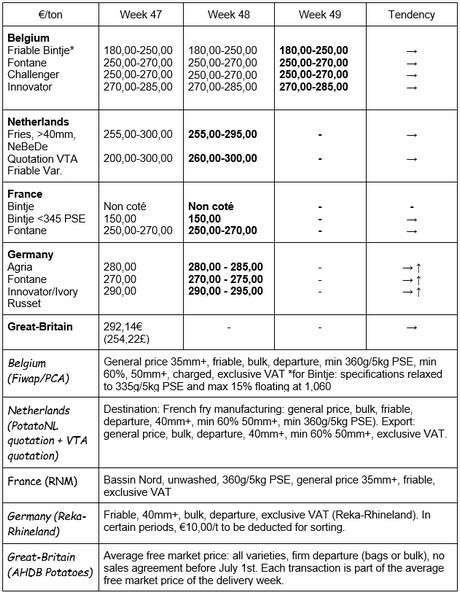 • “defective quality” : more than 15 % floating and/or PSE < 345 g/5 kg : approximately 15,00 €/q. Urgent offer decreases (progressive depletion of stocks). Innovator : 27,00 to 28,00 €/q ; firm market. 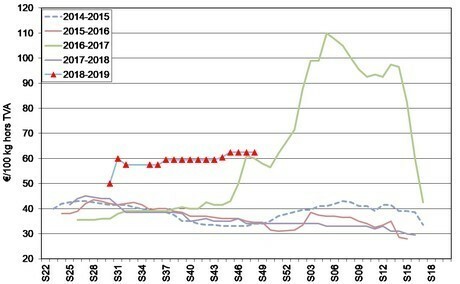 Last Thursday’s quotations saw the higher prices reduced for several industrial varieties, sign that the Dutch factories do not wish to contribute to the rising prices in December. On the domestic fresh markets, the soft flesh remain between 26 and 34 €/q, while the firm flesh vary between 35 and 40 €/q depending on their washability. Moderate export: 24 – 28,50 €/q at the producer. Stable markets and generally unchanged but firm prices. On the domestic fresh market, the supply pressure is very low, and the demand is expected to rise with the holidays approaching. Firm flesh between 35 and 41 €/q (category 1), soft flesh between 28 and 35 €/q. For export, the 45 mm+ at the producer ranges between 28 and 35 €/q. On the fresh market (Rhineland), prices were unchanged as of November 30th for firm flesh at 32 €/q for the storage output, and at 30 €/q for the storage output for soft flesh. For firm flesh on sale at the farm (Rhineland), prices ranged from 11,00 to 12,00 €/q per 25kg bag (unchanged). Prices up to 30,00 €/q were given for top quality lots. No major change in prices but the market is more firm, regarding quality issues (germination, premature ageing…) and noticeably higher tare. 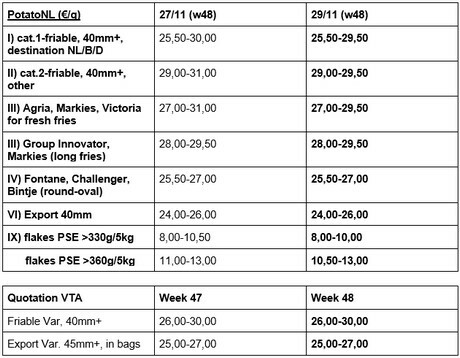 Potatoes for industry (fries): prices are getting more firm, with a range widening upwards. The industry sets priority on existing contracts and works on problematic lots to reduce loss. 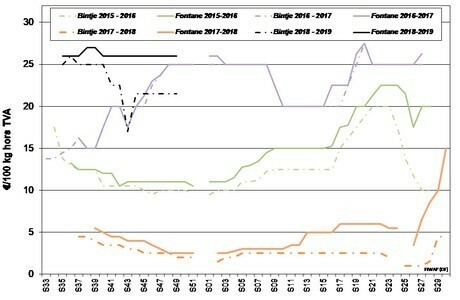 Agria at 28,00- 28,50 €/q, Fontane at 27,00 – 27,50 €/q, Innovator / Ivory Russet at 29,00 – 29,50 €/q. On the transformation market, prices remain stable and firm. Average producer price (all markets) week 47: 29,21 €, compared to 29,10 €/q in week 46 and 28,32 € in week 45. On the markets per bag, prices keep rising for big size lots, ranging between 31 and 40 €/q in friable Maris Piper. The market is less dynamic for the firm flesh varieties, prices stay between 40 and 47 €/q depending on washability (Charlotte, for example). 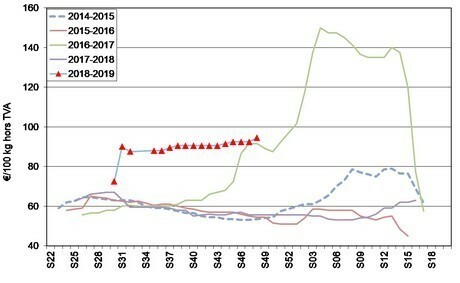 Wholesale markets prioritize the friable quality between 31 (Maris Piper) and 38 €/q (Markies). The local industry offers 27 to 29 €/q but there is also some demand for exportation to the Belgian factories, at more than 30 €/q. (Source : NAPM/USDA via VTA) : The sudden arrival of winter has made it impossible to complete the harvest in Canada. Nearly 13,000 acres remain in the ground, mainly in Manitoba, on Prince Edward Island and in New Brunswick. The Canadian harvest is estimated at 4.6 million tons, down 260,000 tons from last year (-5.3%). In the United States, only Wisconsin left unharvested areas (+/- 5,000 acres). The total US harvest is estimated at 20.5 million tons (down 2.3%).